I can't believe it took me so long to post this! It's been more than a month since I got this palette (previous post here). I just realized it now! Gosh, how fast does time fly these days??!! I apologize for the delay- to those of you who were waiting for this post. 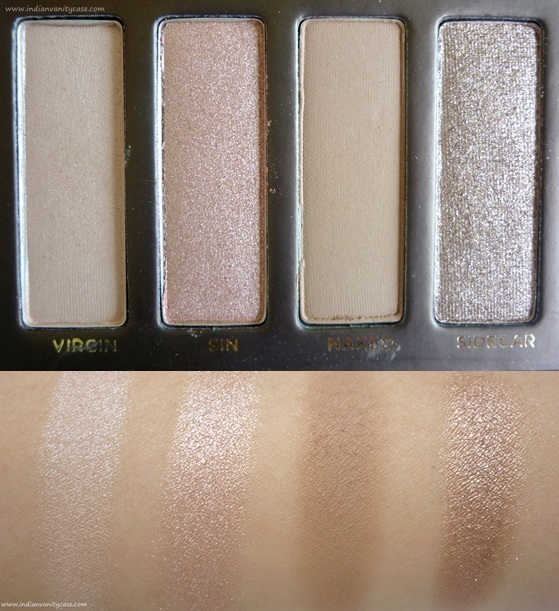 Virgin ~ Shimmery pale beige. This is the least pigmented of all the eyeshadows here. Sin ~ Frosty champagne. 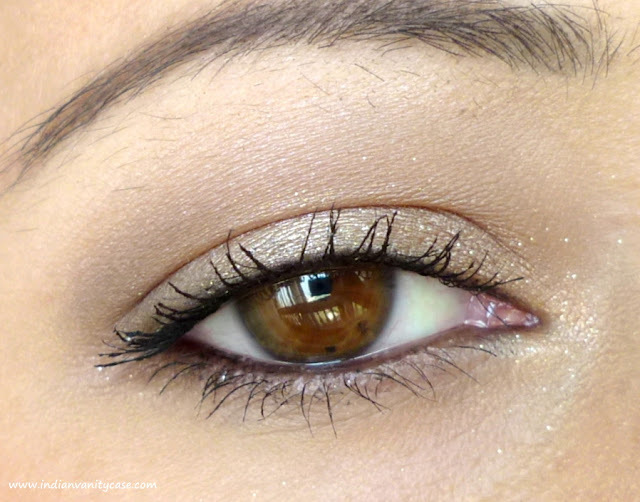 This color catches light beautifully when applied right in the center of your lids. 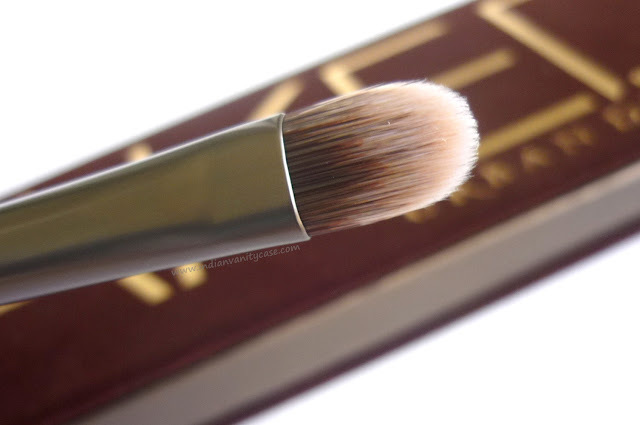 Naked ~ Flesh or browned-beige in matte finish. I use this on my crease & to blend eyeshadows A LOT. Sidecar ~ Glittery taupe-y brown. 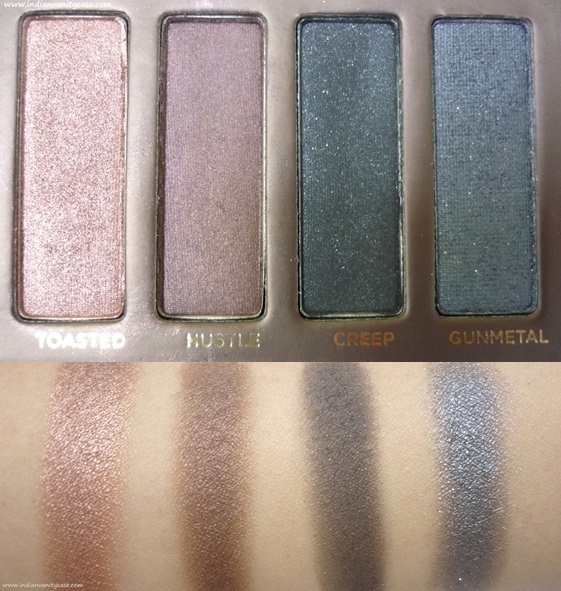 There's always that one eyeshadow in a palette that you notice first. This is the one for me. Fallout prob coz of the glittery-ness, but it's so so gorgeous! Buck ~ Matte medium brown. I use this a lot too. Most times I mix it with Naked if I want to darken the crease area. Half Baked ~ Subtle lustrous bronze. This is the attention wh*re in this palette. It stands out every time I take a photo. 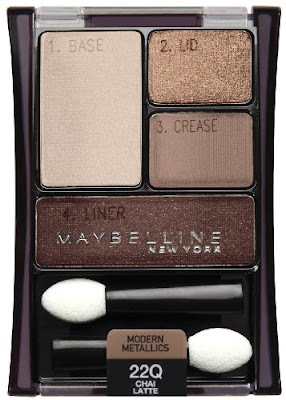 I like to use this on the center of my lids on top of a darker color, like Buck or Hustle, for a bit of drama. Smog ~ Frosted bronze. I think this is my least favorite color in this palette, because I've hardly used it. But it super pigmented. Darkhorse ~ Olive brown with gold shimmer. This is my favorite of the darker colors. It really suits my brown eyes. Toasted ~ Rich Copper, says UD. Really? It looks pinkish. I pair it with Hustle most of the time. Hustle ~ Plum brown. Everyday outer V color. Creep ~ Bluish-Black with silver & gold shimmer (?). 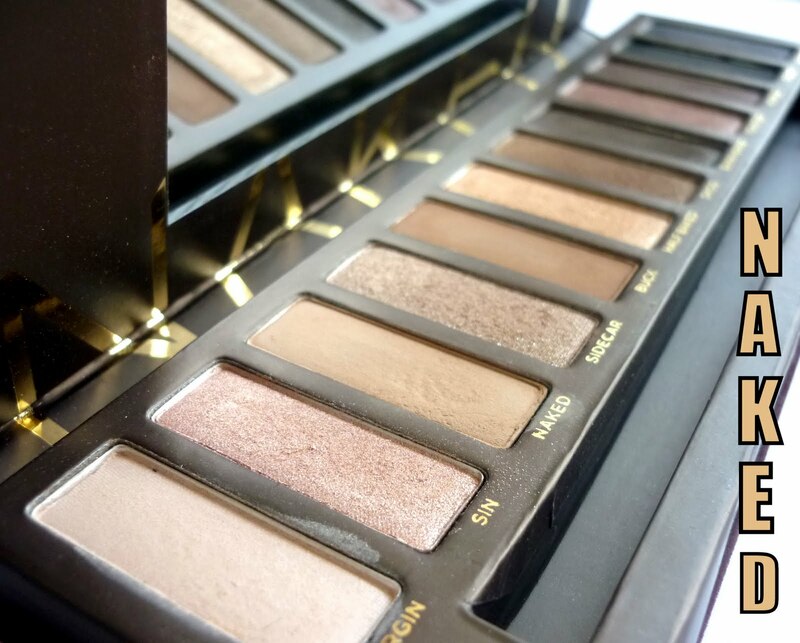 If you want a smokey eye out of this palette then you can't skip this. I use it as a liner when I'm going for neutral. This color could be black's alter ego. Gunmetal ~ Grey with silver glitter. 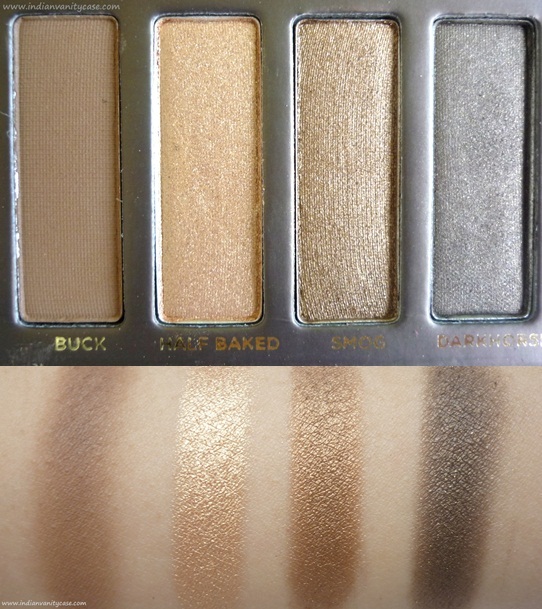 I use this alone mostly, with Naked & Buck on the crease. *I'm kind of confused with the colors & shimmers, so might have to edit the color descriptions late. I'm going to keep it short & to the point. This is the best eyeshadow palette I've ever purchased. 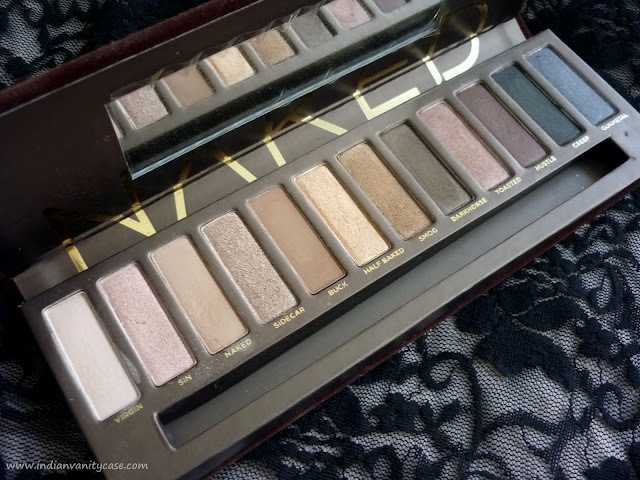 That is because it is one palette with versatile eyeshadows I can practically use everyday. You can say it's the most usable palette. I don't know what I'd do without Naked & Buck. I use them all the time, coz I almost always need to make a fake crease. I can safely say that it is so worth the hype. The eyeshadows, especially the shimmery ones, are so pigmented and smooth. Dislike: Suede cover attracts fibres. But I love it. 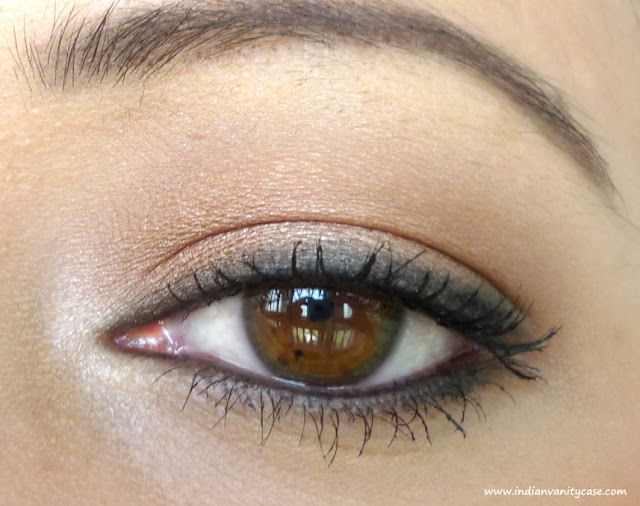 Look 1 ~ Here I used Sidecar on my lid & inner corner & Naked on my crease. You can see Sidecar flies/fall out, but it also look kind of magical in the pic hehe. Look 2 ~ Here I used Hustle all over lid & Creep to line eyes. 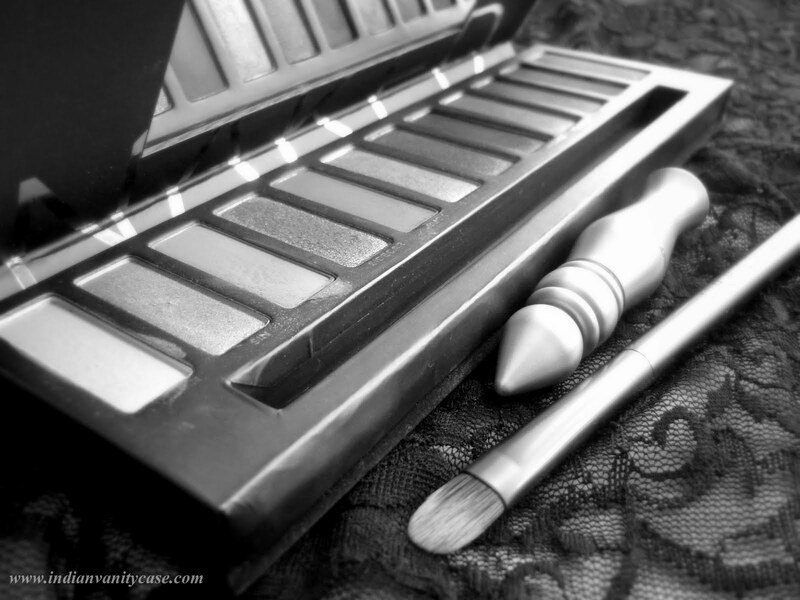 Urban Decay Good Karma Brush ~ Quite versatile, but not for proper blending. It can be used to apply eyeshadow all over,and the thin rounded tip is ideal for lining. I just love how the metallic handle feels. It's totally vegan too! Got it, used it, swatched it, clicked over a 100 photos of it & reviewed it. Now I can sleep. NAKED. Nah, I can't sleep naked! Can't. Makes me feel like a defenseless animal/cavewoman. i have this and i absoloutely love it! I really adore the packaging.. i have never loved brown color better.. also buck & naked look great! Im really wanting to buy some great matte eyeshdaows! Gorgeous Palette Cynthia...and loved the eye makeup you did!! :D especially the second one....simply amazing!!! beautiful palette and apt review cynthia. :)..u know your blog gives me internal happiness..:)...never goes a single day when i don't visit your blog...keep charming us like this always. Gorgeous pictures cynthia...specially the first one~! My favs r sin,virgin & half baked. such a beautiful palette...... wish i culd gt it...!!! cavewoman thing reminds me of flinstone & his family..... dey use 2 luk funny & cute in deir cave attire.......tckr. cali, hahahaha....glad u liked it! the pictures are awesome and tempting...thanks for mentioning the dupe.i love the look you created, its so wearable and pretty. Hello! 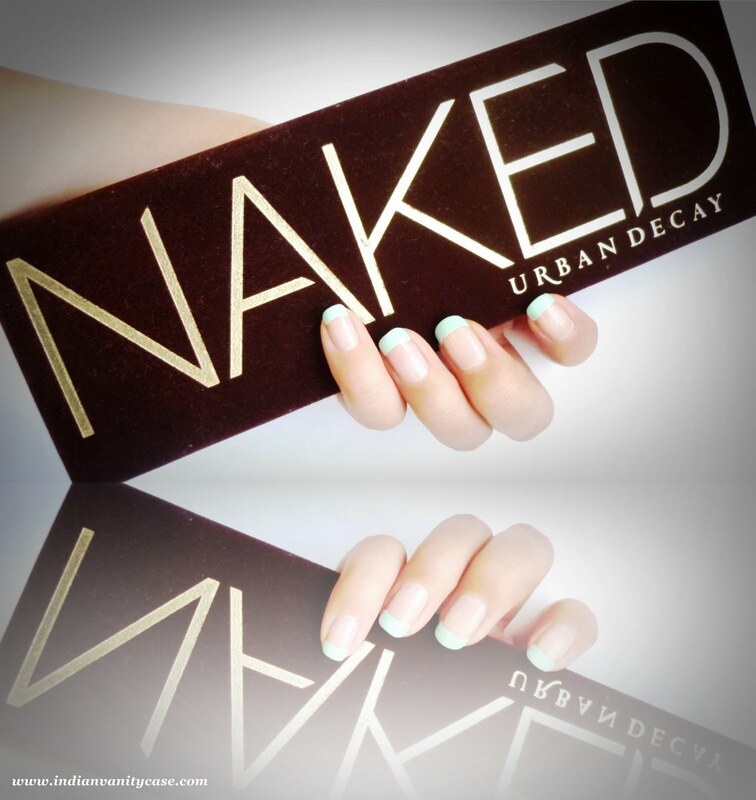 Which is better UD naked or too faced naked eye palette? 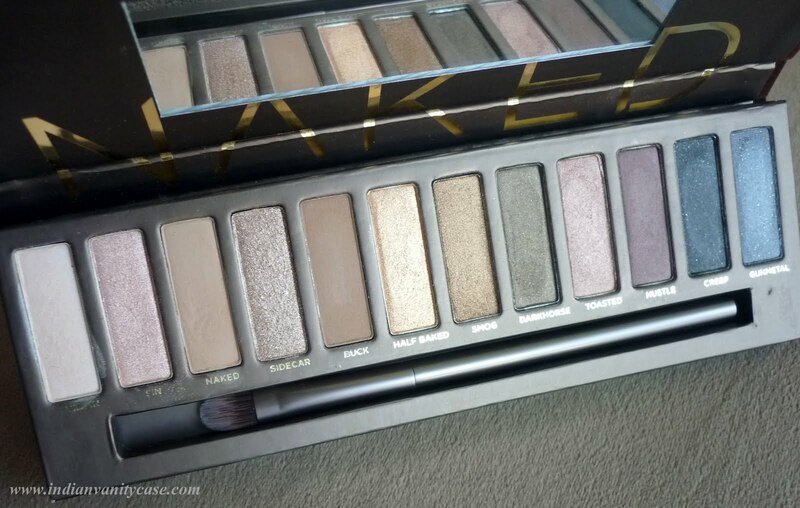 I have UD naked, but I am thinking of getting too faced on too..